Huey frantically searches for his ticket to the big game at Sicks’ Stadium in Seattle, but he can’t find it anywhere. Will he miss the game? In 1955, baseball fans in Seattle cheered for the minor league Rainiers. Olive-skinned Huey has his glove, cap, and shirt and is on his way to see that pennant-decision game, but he needs to find his ticket. He races through his neighborhood, hearing snippets of the pre-game show and the first innings on all the radios as he visits the places where he might have lost the ticket. His neighbors and shopkeepers—representing a variety of ethnic groups—are invariably friendly and encouraging, but none of them has seen the missing ticket. Of course he discovers that he has had it all along, hidden in his hat, and gets to the game by the fourth inning. There, he has a grand time with his neighbors and friends as they watch the Rainiers win the pennant. Holtzen recalls the sights and sounds of 1950s-era Seattle, naming streets and bus routes, shops and shopkeepers, radio announcer and players. 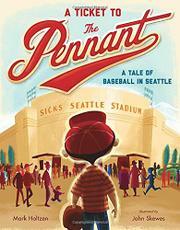 Huey is a delightful little baseball lover who remains mostly cheerful and hopeful throughout his ordeal. Skewes’ bright, retro-flavored cartoons complement the text, vividly capturing the time and place as well as Huey’s changing emotions.